Bristow gets the lowdown on Sir Reginald from someone who really knows. - , he irritates Bristow by describing Sir Reginald Chester-Perry’s life of luxury. Bristow riles him by imitating the sound of a punctured wheel or by pretending to assist in push-starting the Rolls. The chauffeur likes nothing better than to park the gleaming car just outside the office with the radio on; Bristow's retaliation is to encourage his friend the pigeon to drop an appropriate message. , where Bristow seems keen to switch jobs and put on a peaked cap himself. 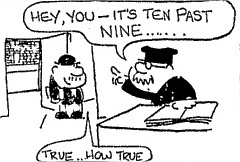 Strip 4508 was published in the Evening Standard in November 1975. What Mrs. Chrisp actually does for a living is not clear. She has never been placed within the typing pool or the switchboard, and does not dress like a waitress. So she is either a personal secretary or that rare breed, a female office worker. But maybe in the past she had some culinary involvement because her name has also been linked with the Great Tea Trolley Disaster. Incidentally Mrs. Chrisp (sometimes known as Crisp) is one of those chameoleon like characters whose appearances changes radically each time we meet her. This can be seen clearly by comparing the inset picture above with strip 4141. I think she is siphoning off the proceeds of her regular collections and indulging in fancy hairdressers, makeovers and expensive plastic surgery, and it is time that this scandal was exposed.